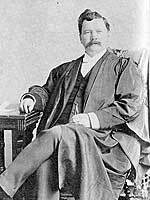 Born near Woodville, Ontario on 27 February 1853, he was schooled at Manitoba College and Trinity School of Medicine, Toronto. He took advanced training in New York, Glasgow, London and Berlin. After studying in the Koch laboratory, he obtained a special certificate from the University of Berlin in the comparatively new subject of bacteriology. He married the daughter of Mr. Edward Thomas, of Nassagawaya, Ontario. They had two sons. Ferguson began practice in Winnipeg in 1881, and was one of the founders of the Manitoba Medical College where he was Professor of Physiology until 1886 and Professor of Surgery until 1894. In 1893 he was offered the chair of surgery in the Postgraduate Medical School in Chicago. From 1900 he was the Professor of Clinical Surgery in the College of Physicians and Surgeons, University of Illinois College of Medicine. In 1906 he was honoured by the King of Portugal with the decoration of Commander of the Order of Christ for his outstanding work in surgery. He devised many instruments and developed an operation for the cure of hernia which is still known by his name. He was the author of The Technic of Modern Operations for Hernia (1907). He served as President of the Chicago Medical Society. Ferguson died at Chicago on 20 October 1911.